What sort of fluids are progressing cavity pumps used for? Progressing cavity pumps are often installed for handling viscous fluids at high flow rates or where a high discharge pressure is required with a smooth flow. Typical fluids may include slurry, mashes, pulps, dough from waste water treatment plants, anaerobic digestion facilities and paper recycling plants. 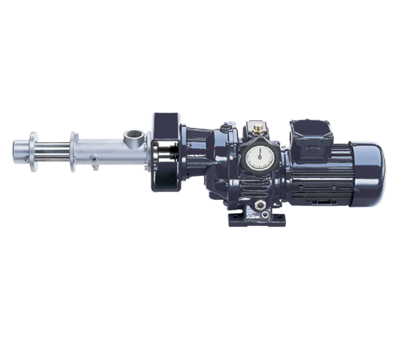 As the pump flow rate is proportional to the speed the pump can be used for the dosing of viscous fluids such as additives and chemicals. PC pumps can be adapted and specified with a range of accessory components and configurations to accommodate the difficult fluids it is expected to handle. The feed inlet with different screw and paddle feeders to break up solids. Progressing cavity pumps must not run dry as the heat generated by the rotor and stator can cause failure - However there are many accessory additions to protect against this, both from the suction side and on the pump itself. Progressing cavity pumps are available with various geometries, typically in different ratios, which effect the degree of entry of the product into the next cavity and the degree of efficiency and sealing between each cavity. 'Standard' geometry is usually best for thicker material as the pitch allows for the viscosity of the product whereas long geometry with shallow curves and larger surface contact between the rotor and stator provides more efficiency.